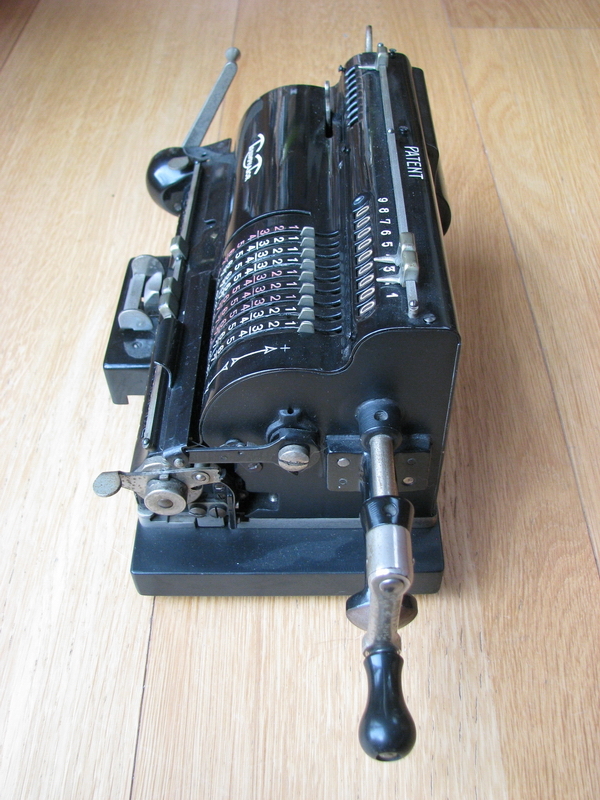 Another machine from the former collection of fellow Belgian collector Freddy Haeghens. 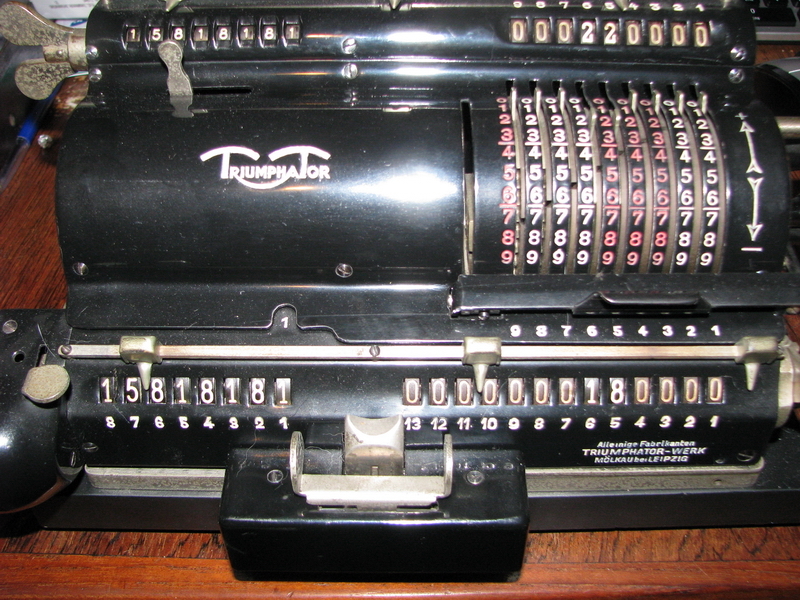 It was sold in a large lot of calculators at - let's call it a well-known auction house for technical antiques. No-one noticed that the machine was "somewhat special". 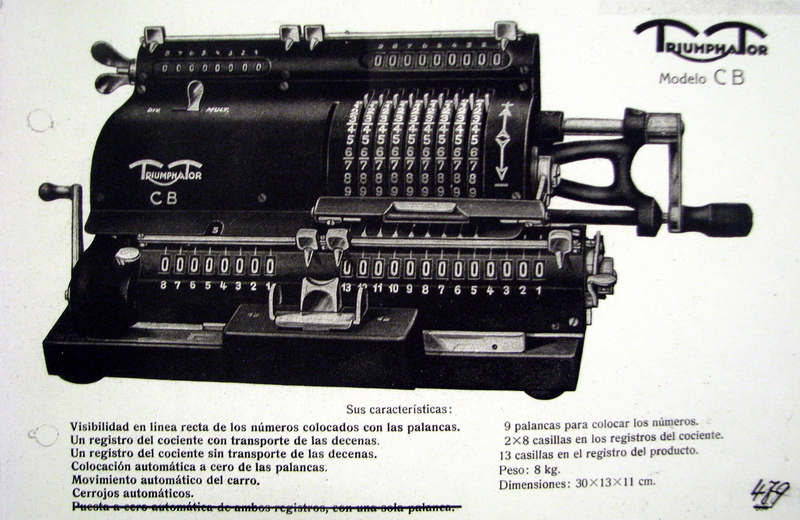 According to Triumphator catalogs, the name of the machine is model "CB", and is was made uniquely in 1928. 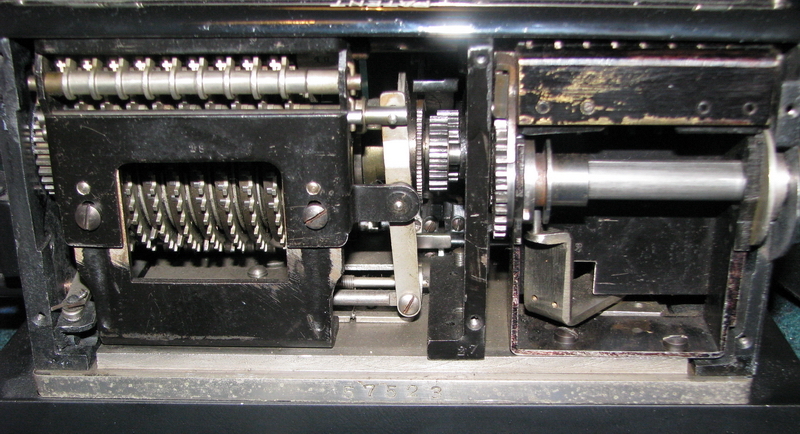 What distinguishes it from the regular model C is the extra revolution counter at the top left of the machine. There is a manual switch for the revolution counter direction, and both counters always count in the same direction. 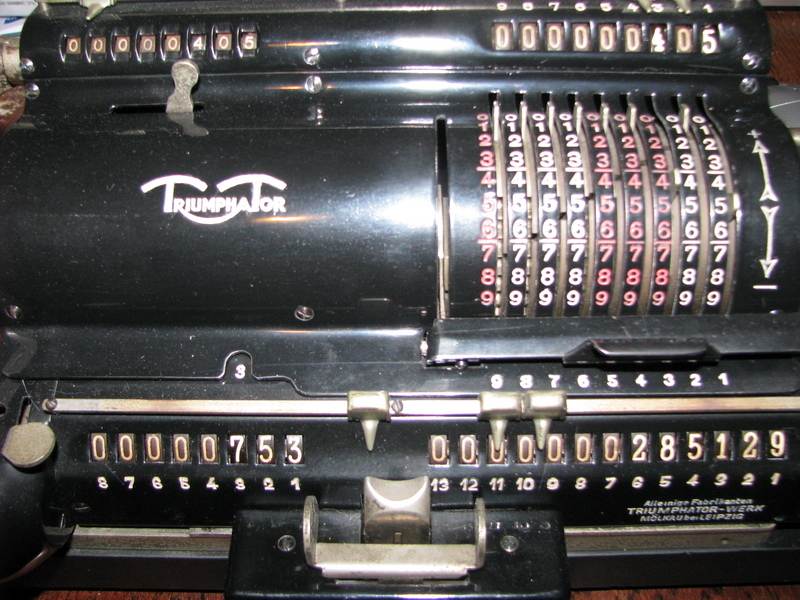 Straight-line visibility of the numbers set with the levers in the setting register. Capacity is given as 9 x 8+8 x13, weight is 8kg and dimensions 30 x 13 x 11 cm. 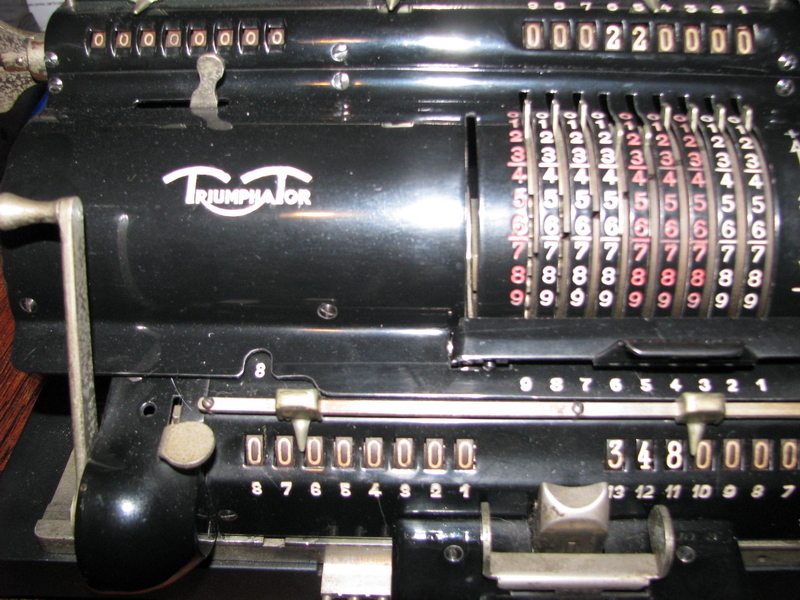 The serial number of this machine is 57352. I have never seen another one, or pictures of one. One wonders what the second counter register could be used for - proofs of a calculation? 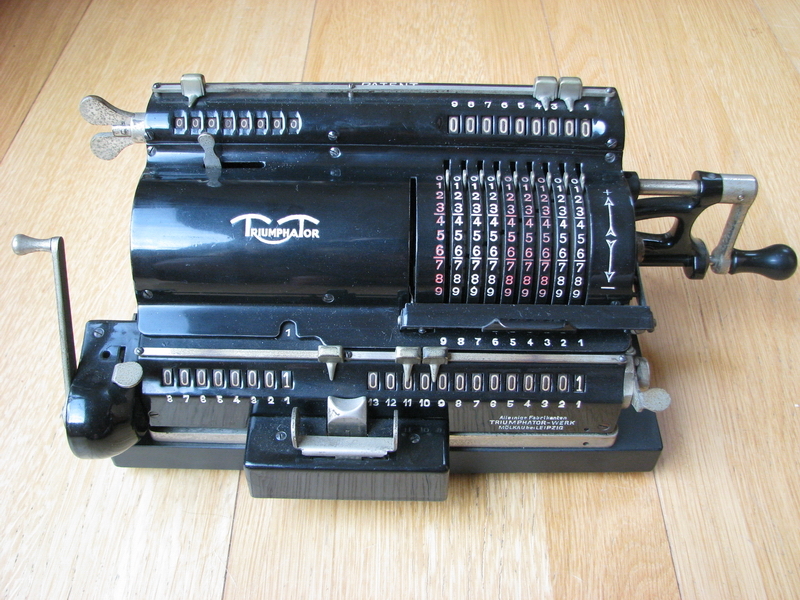 A memory/grand total register for the result makes some sense, but for the counter register? If anyone has any ideas, I'd love to hear about them. 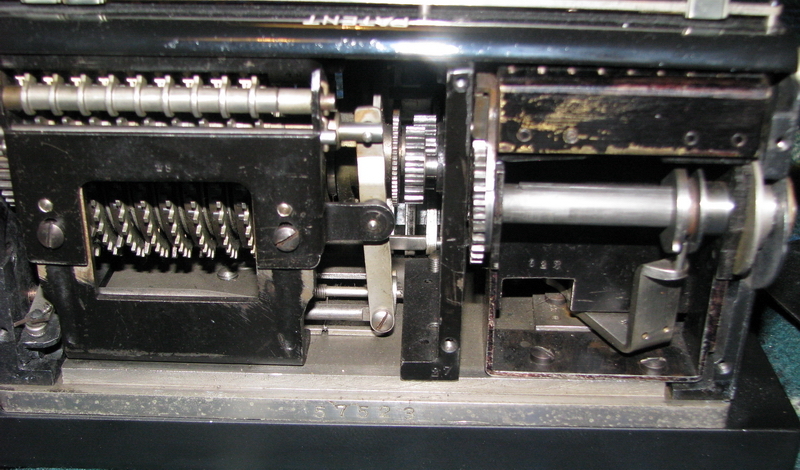 It can be recognized in the following two pictures, taken from the back of the machine, that the drive to the top counter register is from the right side, and that the system used for pivoting the arm that directs the one-tooth counting gear to the correct position as the carriage moves from left to right is quite similar to that of the Brunsviga J and MH - there is a pivot point on the base of the machine. 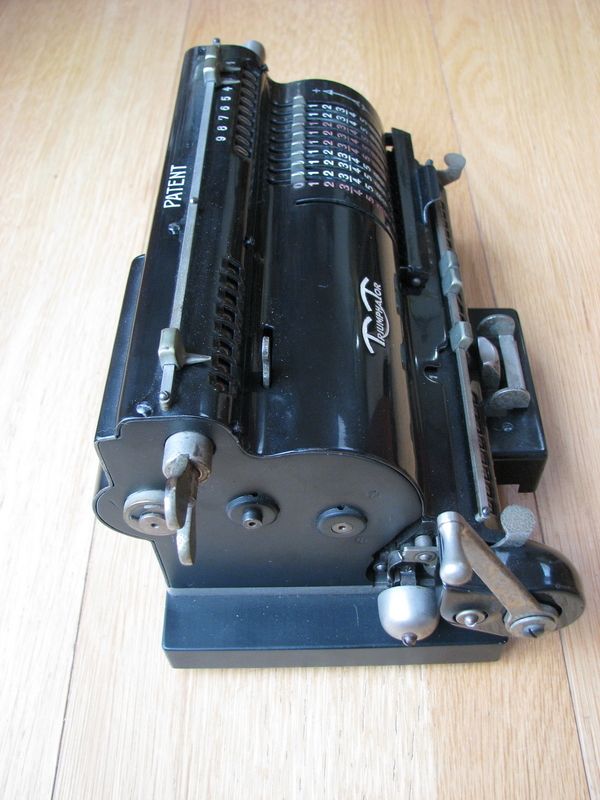 A very interesting machine, and I am very happy it found its way to my collection. Now, a note on how to possibly use this thing. And in this way we can continuously sum a series of numbers and their squares, which would be very useful for calculating variances and standard deviations in statistics. 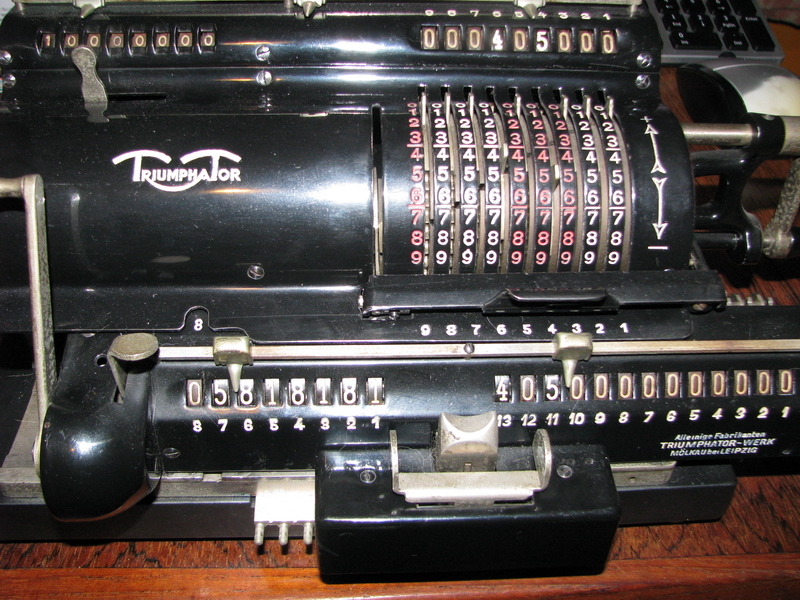 nOw, to be sure, this can also be done with onyl one counter register, but then you have to count off each digit yourself, and you have no positive proof anywhere that you did not miscount. 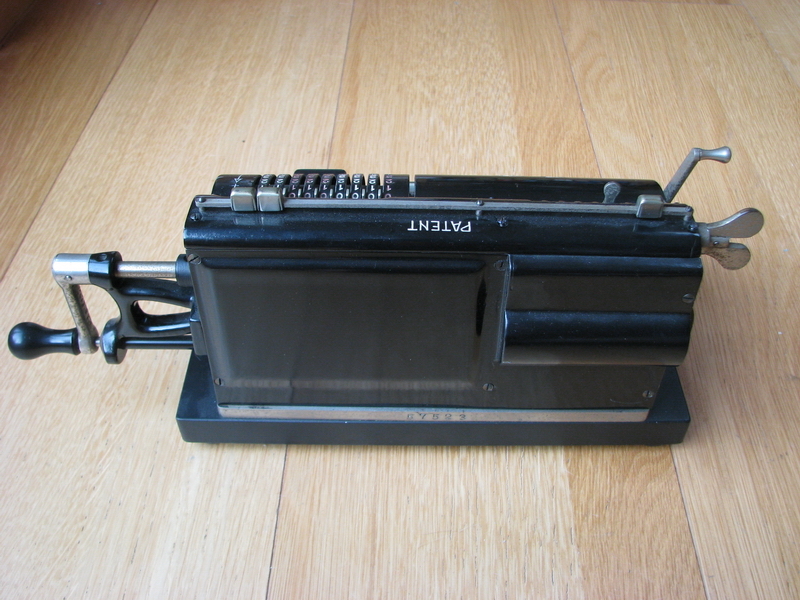 Another use is to do continuous sums of products. 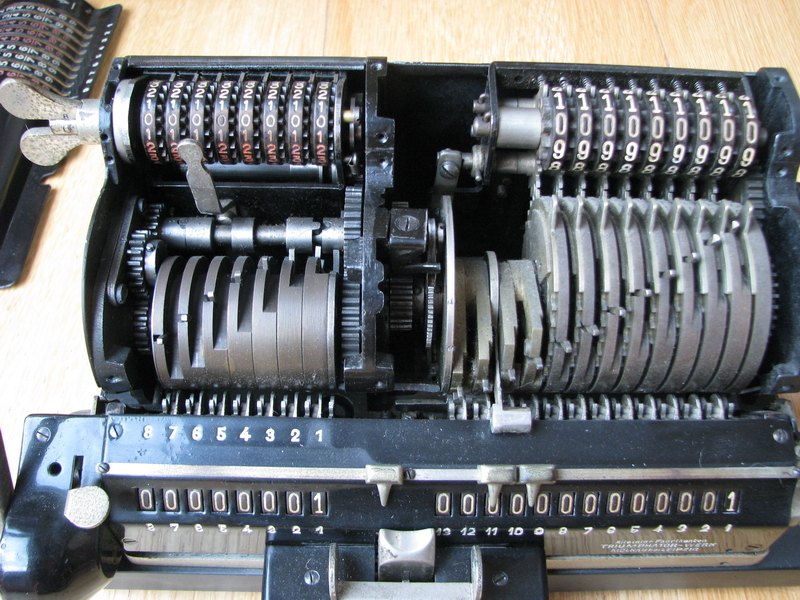 You can also do this with any mechanical calculator, but the Triumphator CB allows to keep track of the individual terms as well, which could be useful. 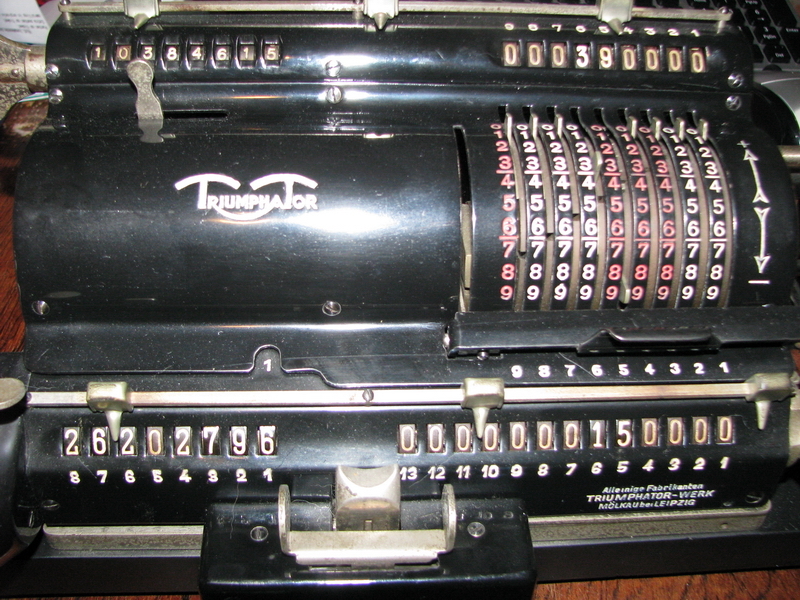 then we set the machine to subtraction, and divide. 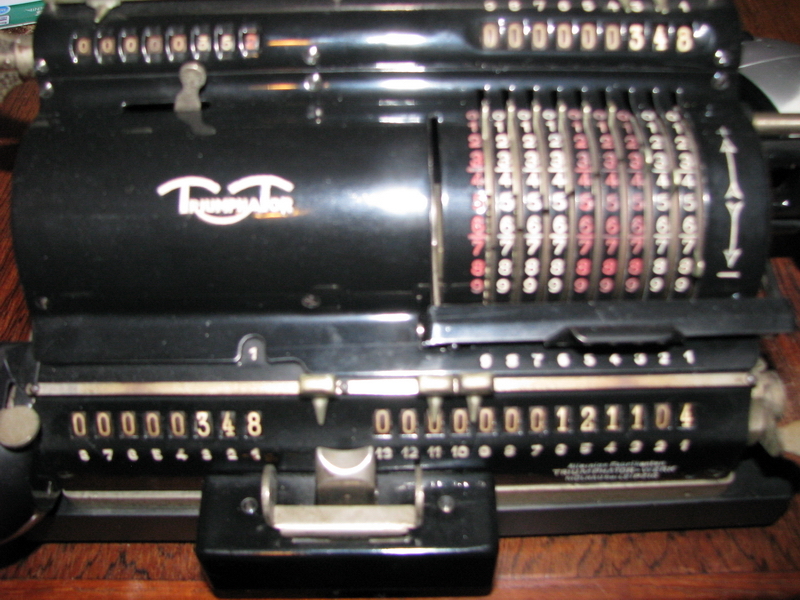 The quotient (15,818181) will be in both counter registers. 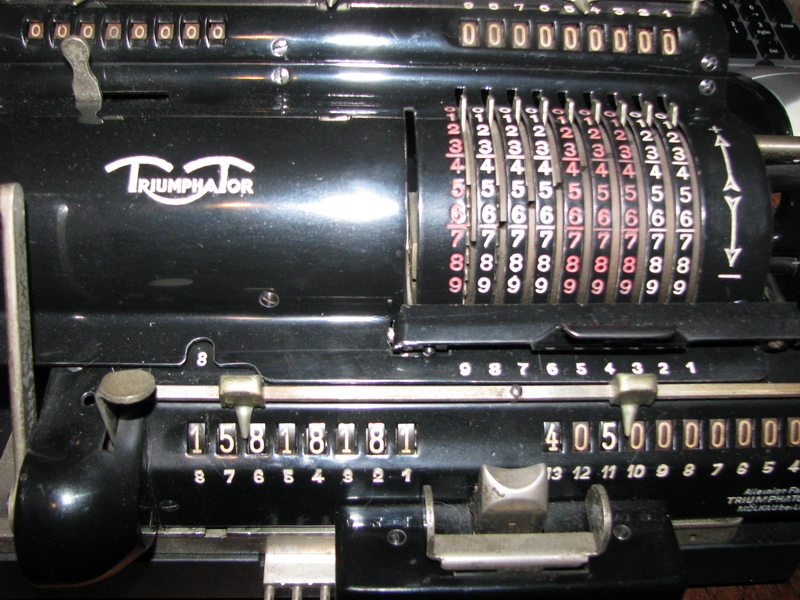 Now comes the clever part - we clear the result and top counter register, set up the second dividend in the setting register, and transfer it to the result with a positive turn. then set up the divisor, and divide. 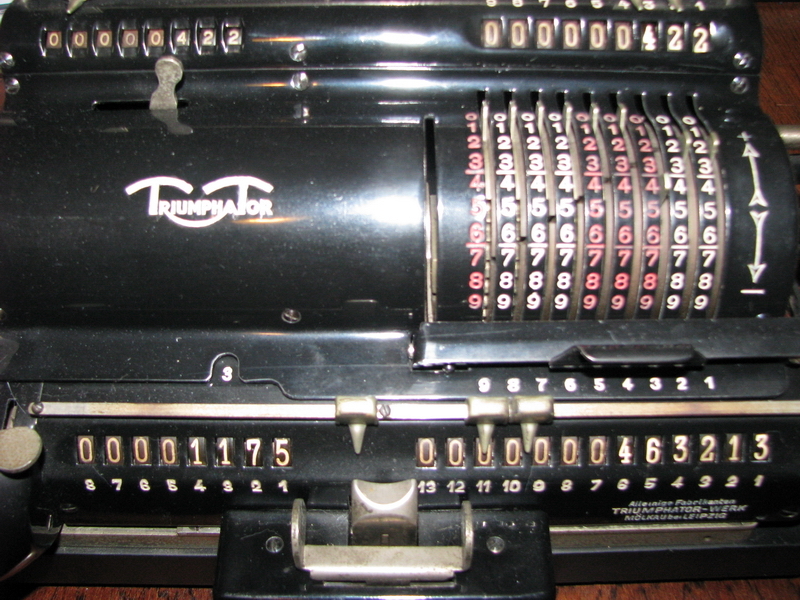 Now the bottom counter register contains the sum of the quotients, whereas the top register contains only the last term, which would otherwise not have recorded. What more could you possibly want for the small price difference with the regular Triumphator C? Clearly companies did not see it that way, as this appears to be the ony example left in the world!